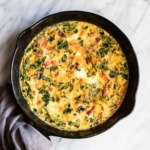 Ready in 20 minutes, this colorful Low FODMAP Frittata with Bacon, Bell Pepper and Spinach is great for breakfast, an easy weeknight meal, or holiday brunch! I kind of can’t believe I’ve waited this long to share this recipe. It is my GO-TO breakfast whenever we have guests. 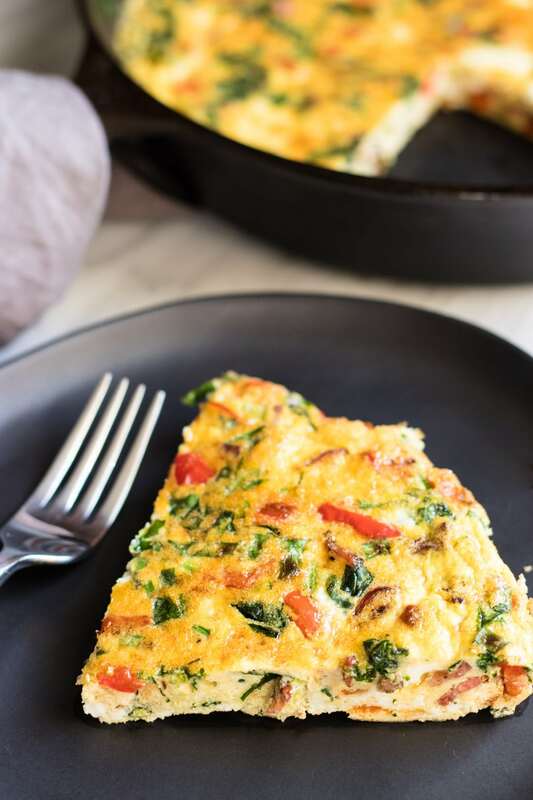 This Low FODMAP Frittata with Bacon, Bell Pepper, and Spinach is not only FODMAP-friendly, but it’s also really easy to make, looks pretty, and tastes great. It’s perfect for breakfast, brunch, or even an easy weeknight meal. And with the red pepper and green spinach, it’s a great holiday dish! It’s also really easy to modify based on your guests’ preferences or dietary needs. For example, I often omit the spinach when I know I have guests who aren’t as keen on green veggies as I am. 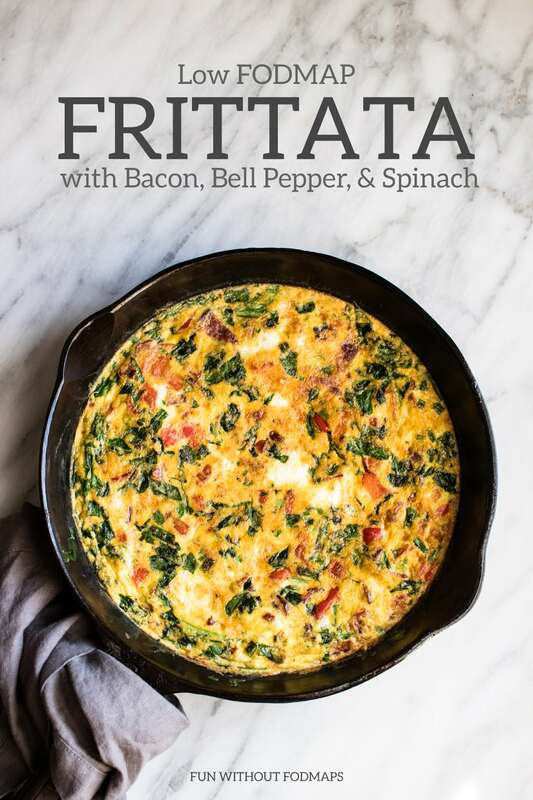 🙂 I’ve also omitted the bacon (and added a bit more cooking fat) to make this frittata vegetarian-friendly. 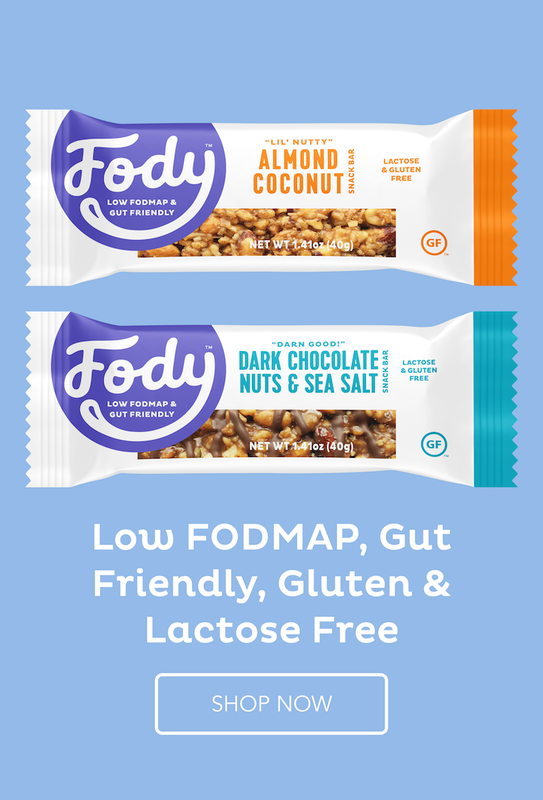 You can also easily sub in other FODMAP-friendly veggies. This recipe uses a cast-iron (or other broiler-safe) skillet. If you don’t own one, you could also turn this into an egg bake by baking in a glass baking dish or muffin tins. To do this, I would cook the bacon and veggies per recipe instructions. Place the veggie and bacon mixture into the baking dish or divide into muffin tins and then cover with the egg mixture. Stir to mix everything up and then bake at 350°F until cooked throughout. When I make this for company, I like to create a little serving station where guests can build their own plate. I usually put out condiments (per my sauce-fiend-of-a-husband’s request), fruit, and beverages. 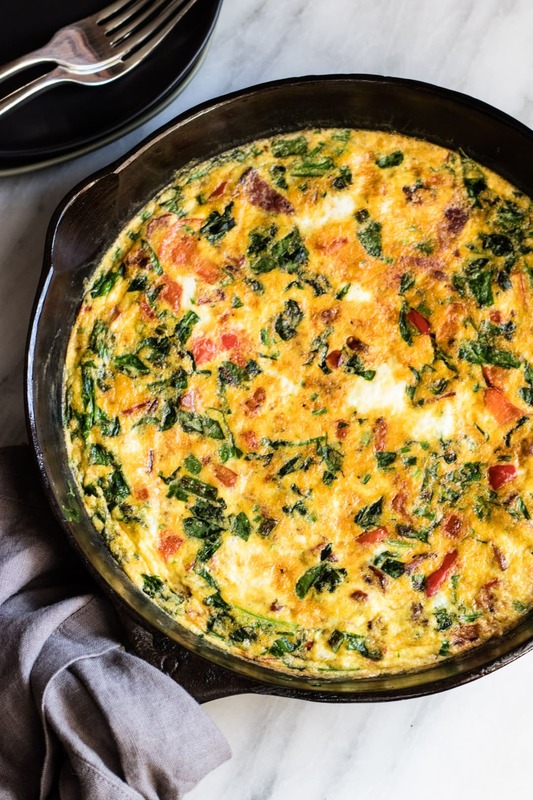 This Low FODMAP Frittata with Bacon, Bell Pepper, and Spinach is not only FODMAP-friendly, but it’s also really easy to make, looks pretty, and tastes great. It’s perfect for breakfast, brunch, or even an easy weeknight meal. Preheat broiler. Beat eggs until well-combined and set aside. In a cast-iron or other oven-safe skillet, cook bacon. Once cooked, remove bacon and dice. Set aside. In the now empty skillet, melt ghee. Add bell pepper and cook until soft. Stir in spinach and cook until wilted. Return the cooked bacon to the skillet and stir to mix. Add optional chives to the beaten eggs. Pour eggs over the veggie and bacon mixture. Stir to mix. Cook for 4 minutes on the stove, gently scraping the bottom occasionally with a spatula. Then, place skillet under the preheated broiler and continue to cook until done about 5 minutes. Remove skillet and allow to cool slightly before slicing and serving warm.